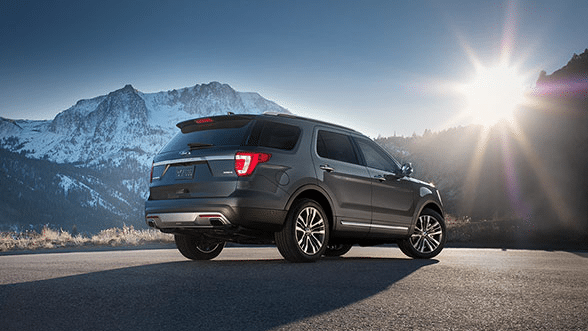 The 2016 Ford Explorer is the ideal SUV for long weekends, long road trips, and navigating the busy cities. In addition to all-terrain capability with available Intelligent 4WD and an abundance of standard features and technology, the 4-door Explorer is a testament to Ford being Canada’s Best-Selling Automotive Brand for seven years running (2009-2015). Available 2016 Ford Explorer trim levels include the Explorer Base Model, XLT, Limited, Sport, and Platinum. 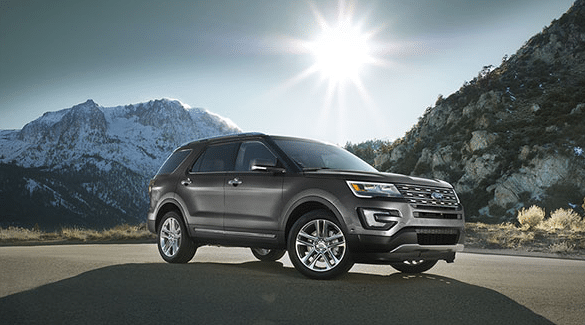 The brawny exterior body of the 2016 Ford Explorer has smooth lines and appealing contours. Highlights include standard low-beam LED headlights with Signature lighting, a range of 18- to 20-inch wheels, and a fresh, redesigned front, rear, and roofline. The Platinum comes with exclusive exterior features such as satin chrome accents and 20” aluminum wheels. Dual chrome exhaust tips are standard while twin-fascia integrated chrome exhaust tips are available. LED taillights are standard and fog lights are an available feature. Roof side rails are a great feature to have which enhances exterior versatility and are available in different colours such as silver, gloss-black, or satin chrome. You will find the interior cabin of 2016 Ford Explorer to be very spacious with comfortable legroom and headroom in all seven seats. Cloth seats are standard in addition to numerous leather options available. Other features include MyKey, air filtration system, and steering wheel-mounted controls. The first-row centre floor console with wrapped armrest and storage bin is a convenient interior storage area that is easily accessible. Available interior highlights include ambient lighting, leather-wrapped steering wheel, leather-wrapped shift knob, and lighted front scuff plates. An available dual panel moonroof offers an amazing view from inside the cabin. SYNC with MyFord is standard on the Explorer Base Model while SYNC with MyFord Touch comes with all other trim levels. SiriusXM is available as well as a Sony Premium Audio System with 12-speakers. A voice-activated navigation system as well as a media hub with two USB ports and an SD card reader are additional available features. Performance is met by three engine options for the 2016 Ford Explorer each provide their own key merits in terms of extra power or increased efficiency. There is a 3.5L Ti-VCT V6 and two EcoBoost options for superior fuel economy. The 6-speed SelectShift automatic transmission delivers smooth handling and acceleration. Intelligent all-wheel-drive is standard with the 3.5L EcoBoost and an option on the 3.5L Ti-VCT and 2.3L EcoBoost. Never underestimate the capability of the 2016 Ford Explorer with its award-winning design. Drive the most comprehensive SUV out there in terms of delivering on all that counts when you get behind the wheel of a 2016 Ford Explorer. The Explorer model has been a staple in Canada for a long time, and the 2016 edition holds nothing back once again. Experience all it can offer you and your family with a test drive! Come in to your local Vernon Ford dealer - Watkin Motors Ford to view our extensive inventory of new Ford models. From SUVs to sedans to trucks, Watkin Motor Ford has the experience and know-how to get you driving home in the perfect new Ford vehicle!